Walking over the crooked stones lining the conurbation of hilly alleyways that form the medina of Fez, the smell of mule dung hangs in the musty air, as it has for over a thousand years. From the 11th to the 15th centuries, this was North Africa’s epicenter of commerce, science, and religion. Saints lived and died here. Kings chose it for their thrones. Bartering still means boisterous haggling while shopkeepers offer sweet mint tea. Transporters yell “balak!” (Clear the path!) leading overburdened animals of labor. 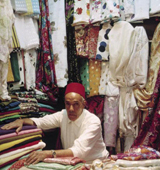 Several medinas exist when traveling in Morocco, but Fez is the most alive with trade, having sustained itself much longer than many of the bulwarks of free enterprise in the West. The perplexing labyrinth is separated into souks, or markets where one type of good is made and sold. Brimming with tourists and locals alike, the densely packed lanes are teeming with fruit stands, meat stalls, and vendors vying passersby who offer the slightest glance. False guides – faux guides – were once abundant in Fez to lead tourists through the morass of alleyways. But, government crackdowns now mean heavy fines and jail time for those caught. While an educated, certified guide could recite facts about the city’s history, one faux guide named Nasser agreed to reveal the medina’s nitty-gritty way of business. Moroccans and tourists often travel to Fez just for its renowned leather – jackets, pants, cushions, lamps, and world-famous babouches. We gaze down from one of the abundant boutiques that encircle the fetid tannery where a work spot full of yellow, brown, and orange dye-filled vats is cherished and passed down from one generation to the next. “It is the dirt[iest] work,” Nasser articulates as the malodorous concoctions bubble below. The workers’ splotched skin matches the colors of their dyes. “The leather has to be cured so it sells … The difference between who makes the real money is whether you are standing here or laboring down there,” he ends without sentiment.